Dave Rolsky taught classes at YAPC/TPC for a number of years and he was compensated for it. As Dave is a new member of the TPF Board and TPF organizes TPC, there is a potential conflict of interest. Dave wishes to continue his class. The typical rate paid by students is in the range of $150-$175 ($165 in 2018). TPC takes a portion of it to cover expense such as venue and the remaining part goes to Dave. Other costs such as transport and accommodation were paid by Dave. Dave also participates in TPC as a volunteer, working on the website for 2019. Dave is not involved in talk or class selection, nor is he in any Slack channel/email list/etc., where this will be discussed. The 2019 DC-Baltimore Perl Workshop will be in Silver Spring, MD, on April 6th, 2019. The call for talks is now open and this year's themes are Perl (of course) and related technologies. Proposals can be submitted through the workshop website until Jan 31, 2019. Registration is also open and attendance is free for speakers, students, and people currently between jobs. We hope to see you there! As a somewhat delayed follow-up, TPF once again had a booth this year at OSCON, back in Portland, Oregon, this year. Josh McAdams was once again our organizer and staffed the booth for the event. 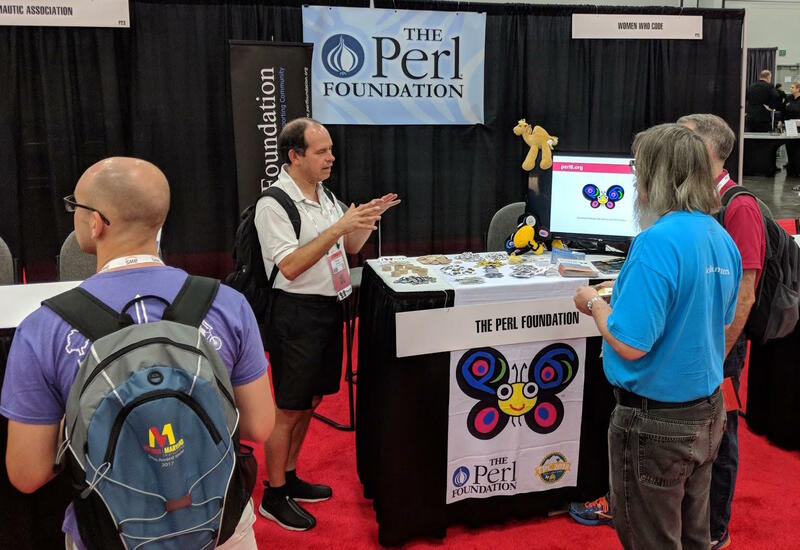 O'Reilly provided The Perl Foundation with an excellent space in their Expo Hall. Situated conveniently near the lunch service, snacks, and an amazing swing, the booth received a constant stream of visitors. The visitors ranged from developers with years of experience developing Perl to those who were just discovering what Perl was. Our friends Wendy and Liz graciously provided round tuits, stickers, and other promotional material for the event. The "Introducing Perl6" books where a hit and were gone on the first day! If you didn't get one, there is an electronic version that you can access in the Perl 6 marketing website. The space was a great place for Perl developers to meet up and connect with their peers in person, as well as, a good place for The Perl Foundation to introduce Perl to newcomers. We have a great time at the event and loved advocating for Perl. This page is an archive of recent entries in the Conferences category. Awards is the previous category. Grants is the next category.